The concrete pump plays an important role in construction activities. It is utilized to transfer liquid concrete by pumping it from one place to another. There are different types of truck mounted concrete pumps such as boom or truck mounted pump, trailer, line or stationary pump and specialized usage pumps. Boom or truck mounted concrete pump dominates the market, and it is likely to maintain its dominance during the forecast period. The boom or truck mounted concrete pump offers flexibility during working and a remote-controlled robotic arm is employed, which is known as boom, for placing the concrete accurately at the construction site. It is generally used in large construction projects and has a capacity to pump high volume of concrete rapidly. It also reduces the need of labor due to its multitasking robotic arm. Rising business confidence in Australia, China, countries in Europe, Japan, and the U.S. is likely to boost the construction industry in these countries. Housing prices in the U.S. are likely to appear back to 2008 levels, coupled with a drop in unemployment rate from 10% in 2009 to approximately 4% in 2018. 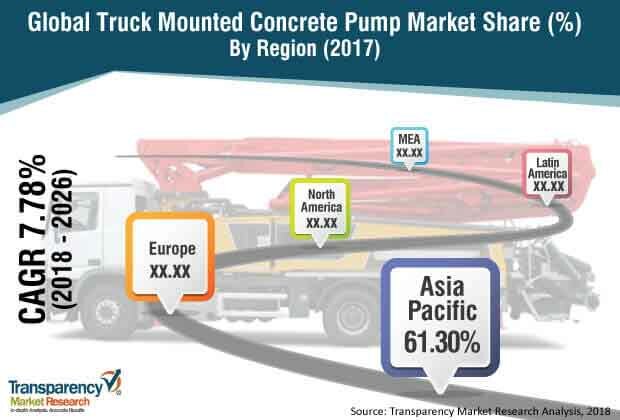 Major investments in infrastructure in key countries such as China, India, and Brazil are expected to boost the construction industry, which is likely to drive the truck mounted concrete pump market in these countries during the forecast period. Business conditions for the global construction industry are good due to several factors such as low interest rates, recovery of oil prices, increase in wages, and significant investment from government and private sectors in construction projects. This is anticipated to boost the global construction industry at a significant rate, which in turn is projected to positively impact the global truck mounted concrete pump market. Shortage of skilled labor, productivity issues, and delay in delivering projects on time are likely to propel the demand for concrete pumps during the forecast period. However, continuous increase in construction cost is anticipated to hamper the truck mounted concrete pump market during the forecast period. The global truck mounted concrete pump market has been segmented based on type, end-use, and region. In terms of type, the global truck mounted concrete pump market has been classified into boom or truck mounted pump, trailer, line or stationary pump, and specialized usage pump. Boom or truck mounted concrete pump has a unique robotic arm that is installed on the back of the truck. The Robotic arm preciously pumps the liquid concrete to every corner of the construction site. Long reach, ability to carry higher volume liquid concrete, flexible usage at large construction sites, high transfer speed, and minimum requirement of labor to handle it are expected to fuel the usage of boom or truck mounted concrete pumps. Therefore, the segment dominates the truck mounted concrete pump market currently, and it expected to maintain its dominance during the forecast period. Based on end-use, the global truck mounted concrete pump market has been split into industrial, commercial, and domestic. Majority of the truck mounted concrete pumps is utilized in the commercial sector, which includes construction of large dams, airport buildings, business parks, hospitals, hotels, and large shopping malls. All these construction projects require advanced machinery along with precise working. Therefore, demand for truck mounted concrete pump is high in the construction industry. In developing countries, such as India and South Africa, governments are aggressively investing in road infrastructure, airports, and business parks in order to provide facilities for people. Consequently, demand for truck mounted concrete pumps in developing countries are likely to remain high during the forecast period. Notable regions considered for the analysis include North America, Europe, Asia Pacific, Middle East & Africa, and Latin America. Geographic analysis has been carried out on the basis of political reforms, production trends, GDP, construction industry and society demand. Asia Pacific holds a prominent share of the global truck mounted concrete pump market. It is expected to maintain its position during the forecast period. Huge investment in major infrastructure projects from the government of China, such as old Silk Road, One Belt and Road mega project, is the driving construction industry, which in turn fuels the demand for truck mounted concrete pump in the country. Rapid expansion of the housing and infrastructure sector coupled with plans to invest huge amount on construction of highways and roads over the next few years is anticipated to propel the demand for truck mounted concrete pump during the forecast period. Major companies operating in the global market are expected to benefit from the acquisitions of other global players involved in the manufacturing of concrete pumps. The market witnesses the existence of vital players who have strong worldwide existence and firm establishments, together with diverse product portfolios. Prominent players operating in the global truck mounted concrete pump market include CONCORD CONCRETE PUMPS INTERNATIONAL LTD, Junjin, Kyokuto Kaihatsu Kogyo Co., Ltd., Liebherr, Liugong Machinery Co., Ltd., Putzmeister Concrete Machines Pvt. Ltd, SANY GROUP, SCHWING Stetter, Sermac Srl, Shantui Construction Machinery co.,Ltd., XCMG Group, and Zoomlion Heavy Industry Science&Technology Co., Ltd. This report analyzes and forecasts the global truck mounted concrete pump market at the global and regional level. The market has been forecasted, based on revenue (US$ Mn) from 2018 to 2026. The study includes drivers and restraints of the global truck mounted concrete pump market. It also covers the impact of these drivers and restraints on the demand for truck mounted concrete pump during the forecast period. Furthermore, the report highlights opportunities in the global truck mounted concrete pump market at the global and regional level. The report comprises a detailed value chain analysis, which provides a comprehensive view of the global truck mounted concrete pump market. The Porter’s Five Forces model for the global truck mounted concrete pump market has also been included to help understand the competitive landscape of the market. The study encompasses market attractiveness analysis, wherein all segments are benchmarked based on their market size, growth rate, and general attractiveness. The study provides a decisive view of the global truck mounted concrete pump market for vehicles by segmenting it in terms of type, end use industry, and region. These segments have been analyzed based on present and future trends. Regional segmentation includes the current and forecast demand for truck mounted concrete pump in North America, Europe, Asia Pacific, Latin America, and Middle East & Africa. The report also covers demand for individual application segments in all the regions. The study includes profiles of major companies operating in the global truck mounted concrete pump market. Key players in the market include CONCORD CONCRETE PUMPS INTERNATIONAL LTD, Junjin, Kyokuto Kaihatsu Kogyo Co., Ltd., Liebherr, Liugong Machinery Co., Ltd., and Putzmeister Concrete Machines Pvt. Ltd, SANY GROUP, SCHWING Stetter, Sermac Srl, Shantui Construction Machinery co., Ltd., XCMG Group, and Zoomlion Heavy Industry Science&Technology Co., Ltd. Market players have been profiled in terms of attributes, such as company overview, financial overview, business strategies, recent developments, and manufacturing footprints. The market for truck mounted concrete pump is primarily driven by expansion of the construction industry across the globe. The report provides the estimated market size of truck mounted concrete pump for 2017 and forecast for the next nine years. The global market size of truck mounted concrete pump has been provided in terms of revenue. Market numbers have been estimated based on key type and End-use for regional segments of the global truck mounted concrete pump market. Market size and forecast for each major type, and end-use have been provided in terms of global and regional/country markets. Primary research involves e-mail interactions, telephonic interviews, linked-in interviews, and face-to-face interviews for each market, category, segment, and sub-segment across geographies. We have conducted primary interviews on an ongoing basis with industry participants and commentators in order to validate the data and analysis. Primary interviews provide firsthand information on market size, market trends, growth trends, competitive landscape, market outlook, etc. These help validate and strengthen secondary research findings. These also help develop the analysis team’s expertise and market understanding.